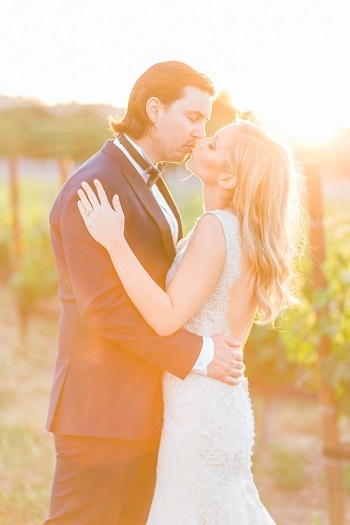 From the moment Alyssa & Eric began planning their wedding, the integration of copper, lavender, and fine wine emerged as the foundation upon which all else was built. 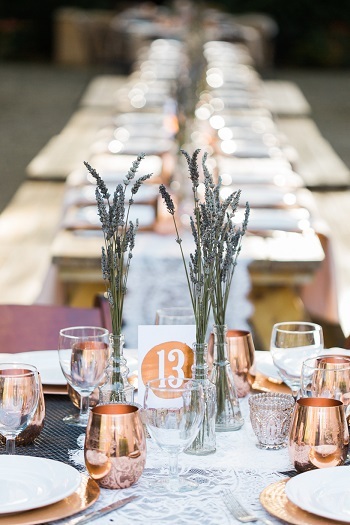 Knowing that copper and lavender would play prominent roles in their wedding day, Alyssa and Eric set out to find a venue that would not only showcase these elements beautifully, but also provide guests with world class wine. 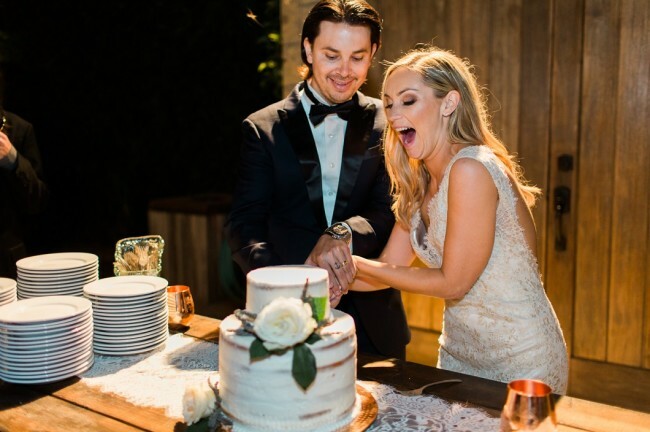 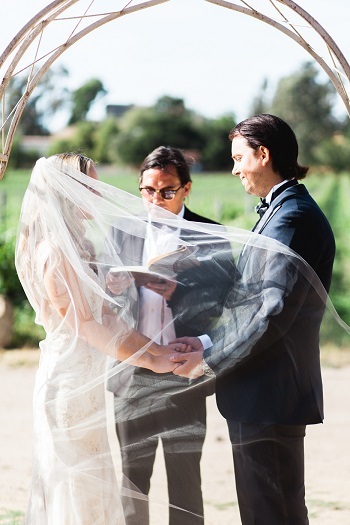 Upon touring Brander Vineyard in Santa Ynez, Alyssa and Eric felt it the perfect setting to begin their forever together. 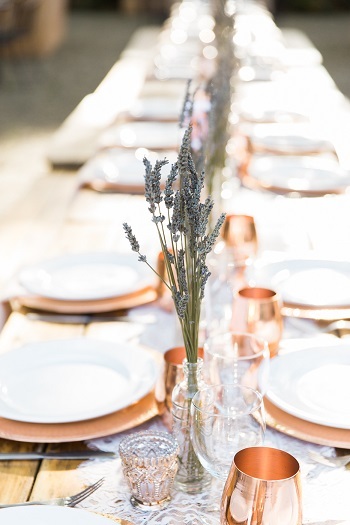 In order to complement the strong presence of copper, Alyssa chose to keep floral arrangements to a minimum so as not to compete with the boldness of this metal. 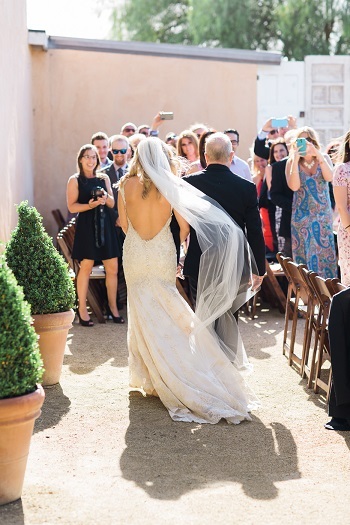 With a strong affinity for lavender, this delicate flower emerged as a perfect counterpoint. 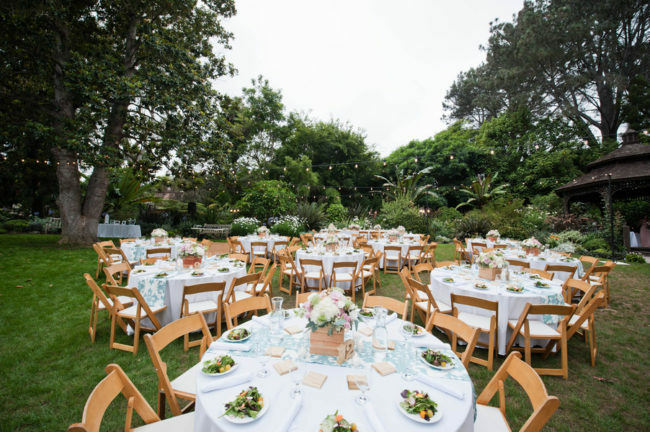 Sprigs of locally sourced lavender were made into small arrangements and placed in mismatched apothecary vessels that were sprinkled among mercury glass votives on each table. 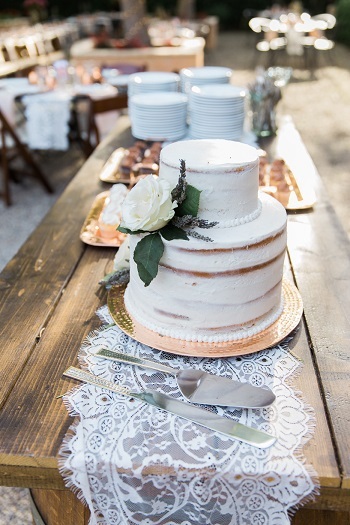 Lavender was further incorporated into the bridal bouquet, placed upon the wedding cake, and lay adorning the bar. 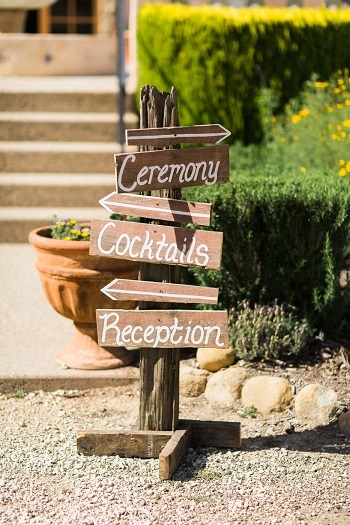 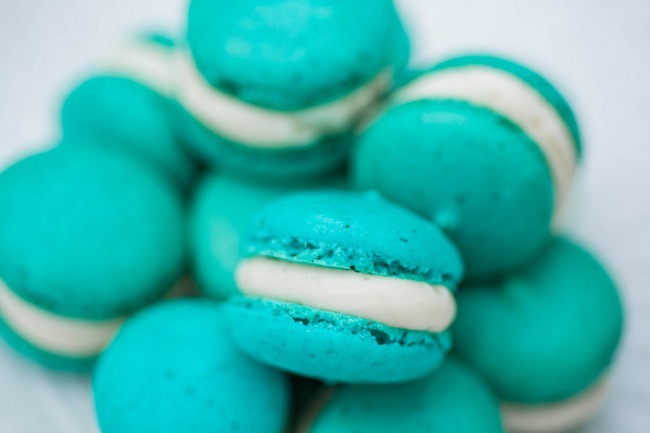 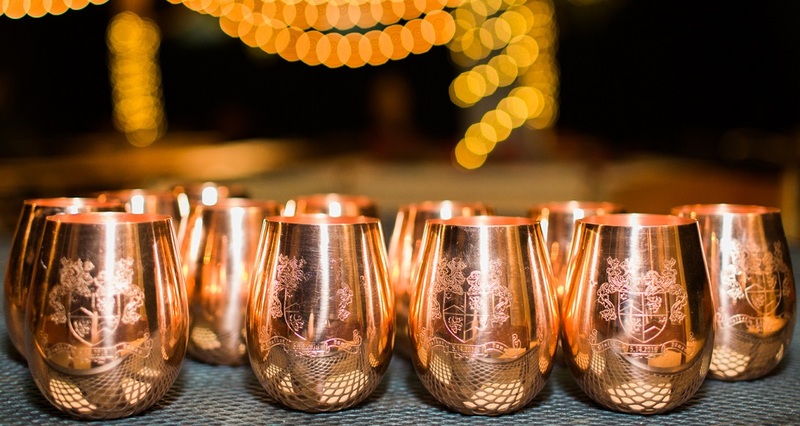 We continue to see copper increasing in popularity as a main metal for wedding decor. Copper also happens to be the foundation of Alyssa and Eric’s business – Copper Mug Co. 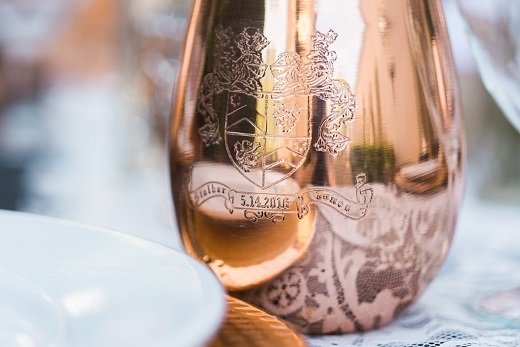 Specializing in drink-ware, Alyssa and Eric provided each guest with a stemless copper cup favor for wine, each engraved with a custom logo (combined family crest) designed by the groom himself. 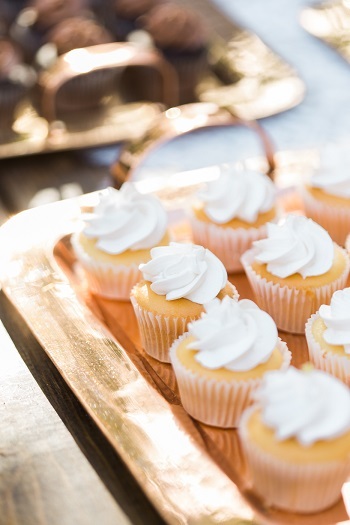 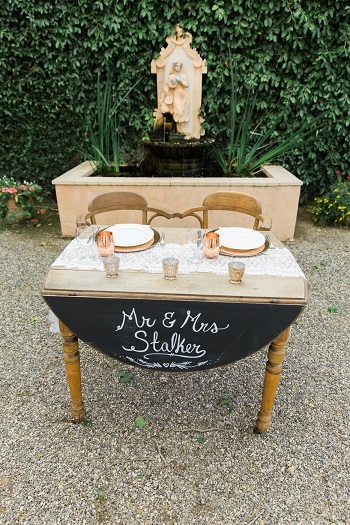 Additionally, the bride and groom handcrafted hammered copper chargers, copper cupcake trays to tie in the dessert bar, and incorporated hints of copper throughout signage and the bar to carry the theme through all elements of the evening.